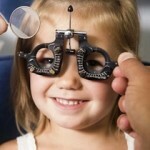 The following article, about vision problems in young children, was submitted for sharing on this site from www.nannycare.com. Adults know when they’re having trouble with their vision, but young children may not realize that anything is wrong. They may think that the poor quality of their sight is normal, or they may be too young to communicate that there’s a problem. That’s why it’s important for parents to pay close attention to tell-tale signs that their child is having vision issues so the problem can be corrected quickly. Early detection is crucial, so here are 10 signs that your child may need glasses. Squinting – The most common sign of vision problems is squinting. Anyone who has trouble seeing will squint to try to focus better. If you notice your child squinting a lot, you may want to make an appointment with the eye doctor. Rubbing eyes – Another tell-tale sign to watch for is excessive eye rubbing. Most children will rub their eyes when they’re tired, but if this begins to happen frequently, then it could be an indication of a bigger problem. Two potential reasons a child may frequently rub his eyes are a subconscious reaction to blurry vision or it could just be allergies. Tilting head – Children with double vision may tilt their head to see more clearly. This could be caused by a muscle imbalance in their eyes that can be corrected with eyeglasses. Headaches or dizziness – Constant eye strain from poor vision can cause headaches and dizziness. If your child complains of frequent headaches in the forehead area or is irritable after reading or watching TV, he may need to see an optometrist. Sits close to TV – Does your child constantly insist on sitting in front of the television? This could be a sign of nearsightedness that can be easily corrected with eyeglasses. Nearsightedness is identified when there is a problem with seeing things in a distance, so kids will sit closer to compensate. Closing one eye – Another clue to vision trouble is closing or covering one eye when reading or watching TV. This could mean there is a problem with one eye, so a child will close it to see more clearly. Because this could be a serious condition, it should get immediate attention. Holds books close – Most children should be able to read books at a comfortable distance, so holding books up to their face is a sign they may need eyeglasses. If your child is a bookworm with her nose continually in a book, she may need a visit to the eye doctor. Problems in school – Quite often children who are having problems in school are facing these issues because of undiagnosed eye trouble. If they’re having trouble seeing the blackboard or reading they can become disinterested or even disruptive. Be sure to have your child’s vision checked if he is suddenly having trouble with school. Lazy eye – When kids have a weakness in one eye it will show up when they’re tired. A droopy eyelid or one eye drifting out of alignment is a sign of a lazy eye that can often be corrected with eyeglasses. Finger reading – Some kids will use a finger to follow the words when they read. This isn’t a clear sign they need glasses, but if it persists, there could be a problem. They may need the finger to keep their place when reading if they have astigmatism or amblyopia. Many vision problems are hereditary, so if parents need glasses, chances are the kids may be prone to the same fate. Nobody wants their kids to have to wear eyeglasses, but left unchecked, vision problems will only worsen over time. It’s much better to have an eye doctor give a clean bill of health than to let your child suffer with poor vision. Merely asking your child if they can see alright won’t work if they don’t know what clear vision is like. Routine vision screenings at school don’t always catch less common eye problems, so a visit to the optometrist may be necessary. Wearing glasses is no fun, but not being able to see clearly is worse. Watch for these signs to make sure your child doesn’t have a vision problem that needs correction.